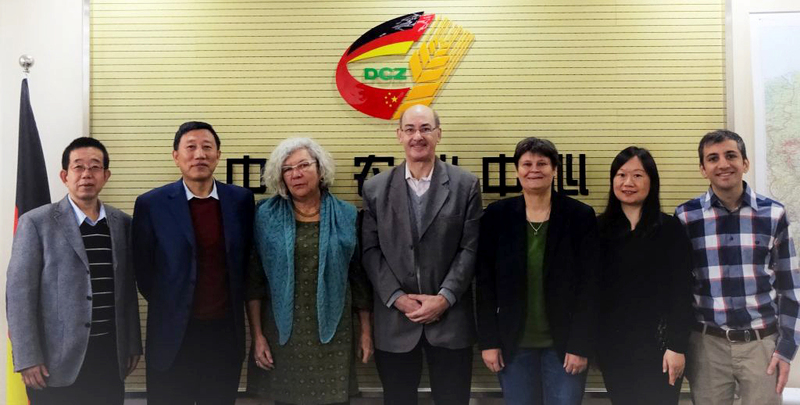 Phase 2 of the Sino-German Agricultural Centre (DCZ) commenced on the 1st of April 2018 and the new international team would like to introduce themselves in this re-constructed DCZ website. has been in China since 2001 and was involved in the implementation of several cooperation projects between the European Union and China, mainly in the fields of Village Governance and EU-China Policy Dialogues. Previously Jürgen Ritter worked as lecturer at the Institute of Chinese Studies at University of Tübingen in Germany, spent several years in Hong Kong and Taiwan, and after 17 years in Beijing regards this as his second home. brings in her long practical experience in sustainable agriculture. As a project manager in the HADDOKKEO National Horticulture Research Centre in Laos she essentially contributed to the successful introduction of tropical fruits in Laos. For the German Rural Development Program in Cambodia she cooperated with institutions of the Ministry of Agriculture, Asian Development Bank and universities. In this complex program she gained as the program coordinator experience in agricultural policy dialogue. is specialized in issues related to China’s environmental policies and resource economy. Prior to working with DCZ, Eva Sternfeld was a visiting professor at the Institute for East Asian Studies at Freie Universität Berlin and head of the Center for Cultural Studies on Science and Technology in China of the Berlin Institute of Technology (TU Berlin). Between 2000 and 2008 she has been working as a foreign advisor for the Center of Environmental Education and Communication of the Chinese Ministry of Environmental Protection in Beijing. She has widely published on issues related to urban/rural development and water management in China. Is a Professor at the Faculty of Development Studies, College of Humanities and Development (COHD), China Agricultural University (CAU) in Beijing. From 1986 to 1988 and 1990 to 1991 as young visiting scholar he went twice to Hohenheim University for carrying out joint research pro­grams in animal science and rural development studies. Since 1991, besides academic activities at the university, he also served as senior consultant for about 70 agricultural and rural development projects financed by Chinese government and international development agencies, such as World Bank, ADB, UNDP, FAO, WFP, UNESCO, GEF, IFAD as well as by bilateral agencies like GIZ, EU, DFID, AusAID. is a scientist at the Academy of Green Development of Southwest Forestry University. 1998-2008 he got master of agriculture engineering, master of agriculture science and doctor title of agriculture science from TH Cologne und University Bonn. 26 years’ experience in China, Germany, Southeast Asia and Africa in agricultural and forestry production, R&D, policy and business consulting, 7 years of which in international projects. He’s served for Hainan Food Industry Co., University Bonn, WTO Tribune, Zhejiang A&F University, TFT, WWF, RA, SGS, IFC, B&Q, Leroy Merlin, Nestlé, Auchan, DuPont, State Grid, Sinograin, Novatis et al. in field of: natural resources planning and evaluation (forest products, oil palm, coffee, tea, mango, bamboo), value chain integration, social and environmental risk management and certification. has long-term experience with Sino-German cooperation projects before joining DCZ. She assists the project team, especially the team leader in their activities and is responsible for office management and financial matters.